The Pierre Auger Observatory is an international collaboration of 250 astrophysicists and particle physicists from 17 countries. Its aim is to discover the sources and likely acceleration mechanism for highest energy cosmic rays, the most energetic particles known in the Universe. These particles must be produced in extreme environments in the Universe, but so far no theory has been able to convincingly explain where, or how, acceleration takes place. The Pierre Auger Observatory is the first collaboration with resources large enough to solve this problem, one of the great unanswered questions in modern astrophysics. Australia's involvement in these studies has spanned thirty years including Sydney University's pioneering SUGAR detector array (covering 70 square kilometres) and the University of Adelaide's long participation in observations in Utah, USA with the Fly's Eye and High Resolution Fly's Eye experiments. Adelaide is a foundation member of the Pierre Auger collaboration, with involvement beginning in 1992. We held a workshop in Adelaide in 1993 to define the scope and capabilities of the observatory and we have held leadership roles in the collaboration since that time. The $50M southern observatory, in Mendoza, Argentina, has been taking data since January 2004, and will be completed at the end of 2007. The Pierre Auger Observatory is an international scale project that could not be funded by a single country alone. The importance of the science and the unique international nature of the collaboration was partly responsible for project leader James Cronin (Nobel Prize, 1980) of the University of Chicago receiving the US National Medal of Science, presented by President Clinton in March 2000. The citation read "for fundamental contributions to the fields of elementary particle physics and astrophysics and as a leader in creating an international effort to determine the unknown origins of very high energy cosmic rays." Cosmic rays are protons and atomic nuclei which possess enormous energies. The rarest cosmic rays have energies 100 million times greater than protons accelerated by man-made machines at Fermilab in the US or CERN in Europe. The highest energy particle ever observed was detected with the Fly's Eye detector in Utah in 1992 with an energy of 3 x 1020 eV, or 51 joules. Where microscopic particles gain this macroscopic energy, and how they reach us, are the mysteries that have attracted some of the world's best astrophysicists and particle physicists to the Pierre Auger Observatory. The highest energy cosmic rays are extremely rare, with an event rate of roughly 1 per square kilometre per year above 1019 eV falling to a rate of 1 per square kilometre per century above 1020 eV. These particles are of crucial interest because their origin is unknown. Their low rate is a problem, but their high energy is also an advantage, since their paths through the cosmos are not likely to have been affected too much by galactic and intergalactic magnetic fields. If we can view enough particles, the arrival direction map will reflect the distribution of cosmic sources. The Pierre Auger Observatory is tackling the low rate problem with a huge collecting area, covering 3000 square kilometres on an elevated plain in western Argentina. A cosmic ray striking the Earth's atmosphere will initiate a huge cascade of subatomic particles which will travel through the atmosphere at a speed close to the speed of light. 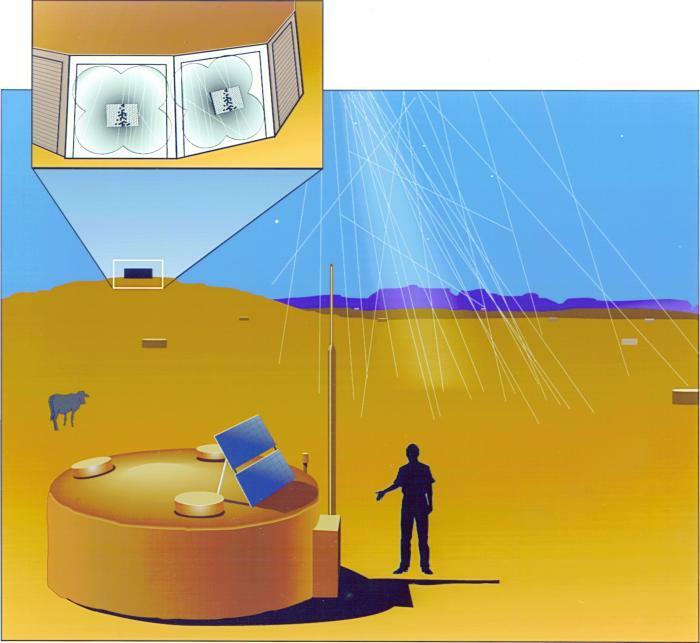 For the highest energy cosmic rays this cascade, or ``extensive air shower'' (EAS), will contain more than 1011 particles and will cover several square kilometres when it strikes the ground. Auger detects the shower in two ways. Twenty four hours a day, an array of over 1600 particle detectors measures shower particles as they hit the ground. This sampling allows a reconstruction of the shower providing measures of the original cosmic ray's energy, arrival direction and mass. In addition, during clear, moonless nights, the showers are viewed as they traverse the atmosphere. 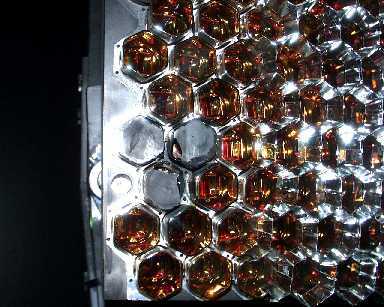 The passage of the showers causes the atmosphere (actually the nitrogen) to fluoresce, and the faint near-UV light is detected by arrays of large mirrors equipped with fast photomultiplier image arrays. The Pierre Auger observatory contains four fluorescence detector sites on the perimeter of the 3000 square kilometre array. Each site views the atmosphere over an elevation range from 2-30º. 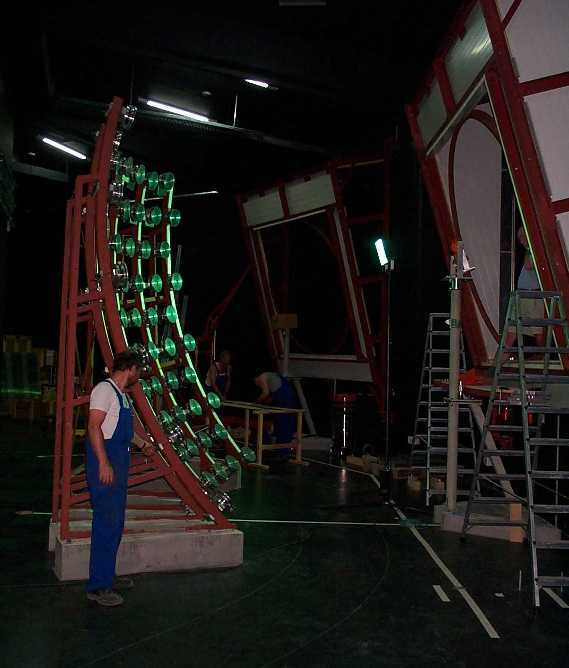 A total of twenty four 3-m diameter mirrors capture the light and focus it onto photomultiplier cameras. Over 10,000 photomultipliers are used in total to view the sky with 1.5º pixels. Despite the low efficiency of the fluorescence process, the huge showers produced by the highest energy cosmic rays can be viewed up to 30 km away. The Pierre Auger Observatory detects approximately 3000 events per year with energies above 1019 eV. Up to 15 percent of these events are viewed by the fluorescence detectors, as well as the regular surface detectors. The hybrid nature of these observations (ground particles plus fluorescence measurements) is, apart from the huge size of the observatory, a unique feature of the Auger Observatory. Each technique for observing giant EAS has its own advantages and systematic uncertainties. The combination of both techniques is crucial for a thorough understanding of the nature and energies of the incoming cosmic rays. 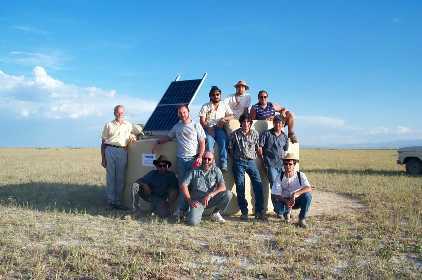 The first group array module at Malargue. Housing for the fluorescence detector. 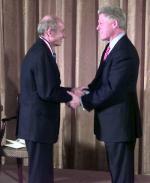 Jim Cronin with Bill Clinton. Schematic of EAS detection using Auger. Frame of an Auger mirror. Closeup of a PMT camera.